Frain has a variety of dryer equipment in stock. We have vacuum freeze drying equipment for the reliable preservation of a wide range of pharmaceutical and chemical products. 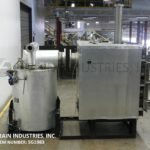 This includes both standard and customized drying equipment including vacuum freeze dryers, shelf dryers, freezers, fluid bed, drum, rotary, spray, and conveyor dryers. BOC Edwards, stainless steel, single door, freeze dryer, 140 sq ft of usable product shelf area with stoppering capability. 60" wide x 72" high x 48" deep total chamber dimensions with inner top plate and (9) 47-1/4" x 47-1/4" stainless steel compressed shelves with bolt down swing open chamber door. Equipped with hydraulic stoppering mechanism. external condenser, refrigeration, heat transfer, vacuum. Control panel has auto / manual, power, vacuum, gas, defrost, heat and mode control on / off switches, with heater controls and pressure gauge and side remote touch pad controller. Vacuum pump, WFS condenser compressor, 21psi @ 260 Deg F with hot gas defrost from refrigerant to the condenser, vacuum break valve, nitrogen air inlet. high and low pressure with reverse acting switches. Glatt "Uni-Glatt’ lab size, stainless steel, fluid bed dryer capable of drying, mixing and coating tablets, hard or soft gel capsules, metal beads and seeds from .5 to 3.0kg. with production rates per hour – depending on materials and application. Uses 4 x 440 kW of heat, 144 cfm fan and has 4" discharge. Available with the WSG Drying Column or Wurster Liquid spray column. System can dry conventional granules, powders and crystalline substances. Mounted on stainless steel base with casters. Self contained lab freeze dryer. condensate capacity: 24 Liters Cold Surface Area; 506 Sq In. Cascade Refrigeration: 40"L x 24"W x 36"H Equipped with pair of 1/2 Hp compressors in series for condenser temperatures to -85 Deg C. Equipped with 18 port manifold with 3/4" valves, temperature indicator -85 To 25 Deg C and thermocouple vacuum gauge. flanged port. 18" OD x 18" long bottom dump lower transition discharge section with 12" OD flanged horizontal bottom side air inlet port.and 1" OD bottom drain 43" OD x 20" deep bottom section drying bowl with (4) leg cart on casters. Control panel has bowl and filter ring, filter position switches, start stop fan, tilt, lift push buttons, timer, air time and air velocity controls with filter sock, product bowl, intake prefilter and intake HEPA filter gauges with chart recorder. Remote above mounted climate control air handling system with dehumitifier, pre-heater, humdifier, final heater and HEPA filters to fluid bed dryer. Stokes Model 72-245 freeze dryer with (7) usable shelves comprising of 84 sq. ft. surface area with 3.5" space between shelves and pounds of product per hour – depending on materials and application. Shelf temperature between -40 F and 180 F with a chill down from 75 F to -40 F in 1.5 hours. Skid mounted external condenser has (4) plates, 50 square foot and 100 liter load capacity at 20mm ice thickness and has a baffled interior to ensure even ice distribution. Refrigeration unit has a York (2) Stage 20 Hp motor uses Freon 502 refrigerant and has a Copeland semi hermetic 3 Hp auxiliary chilling system. Honeywell chart recorder, with vacuum pressure gauge, vacuum pressure recorder, shelf and condenser temperature controllers and Autolyophile AL-101 PLC controls. 304 stainless steel with #4 finish. 4 Square foot working capacity. Two 12" x 24" shelves with 5-1/2" clearance. Equipped with bottom-up hydraulic stoppering, internal condenser, through the door Gassing, 1/2-Hp vacuum pump, 6 liter ice capacity. Steam sterilizable. OAD: 46"Wide x 99" Deep x 76" High. 304 S/S Pre dryer freezer with 270 sq ft shelf area. selves: 15 at 39" x 76" x 4-1/2". Temperature range: to -60 Degrees C. Chamber measures 48" X 83" X 81". Dunn & Bush 30 Hp 2 Stage refrigeration compressor. Glatt Model WST15C, stainless steel, thru the wall design, (3) sections fluid bed dryer, with 15kg, 33lb, 15 litres batch working capacites up to 1300 cfm and 160,000 BTU with volumes of product per hour – depending on materials and application. Equipped with 18" OD x 52" long stainless steel top expansion chamber with 24" OD top flanged thru the ceiling port and 12" OD flanged horizontal top side relief port with butterfly exhaust valve and 5-1/2" OD flanged 3" ID sight port and (2) 5" OD flanged covered ports with 19" long x 14" wide side see thru access door and 40 Kg maximum weight hand crank column lift. 18" OD x 18" deep middle section drying bowl with 5-1/2" OD flanged, 3" ID sight port and (4) leg cart with casters. 18" OD x 18" long bottom dump lower transition discharge section with 12" OD flanged horizontal bottom side air inlet port.and 1" OD bottom drain. 32" long x 29" wide x 96" high inlet air plenum cabinet recieving from above mounted climate control air handling system with pre-screen, dehumitifier, pre-heater, humdifier, final heater and HEPA filters to fluid bed dryer. Control panel with inlet air temperature and volume set point controller with timers, air, filter bowl and manual shaker switches with main control, fan and exhaust controls, AP product bowl, air filter and air prep unit megnehelic water gauges with chart recorder. Remote air handling and fan system for quieter, cleaner, safe running operation. Virtis, Model 51 SRC-5, 10.67 square foot tray area, stainless steel, cabinet style, freeze dryer with number of product per hour – depending on materials and application. Equipped with 28" ID x 26" Deep product chamber and 32" OD / 28" ID swing open, see thru chamber door with (4) 24" long x 16" wide stainless steel shelves has Internal condenser with spray applicator and 1" OD spray nozzle with shelf temperatures from -45 Deg C to + 65 Deg C and condenser temperature to -82 Deg C. with ice capacity of 18kg in 24 hours and vacuum is controlled at 5 microns absolute with sterilzing medium of gas and steam. Control panel has touch pad controller with readout, gas inert back fill, start and stop stoppering buttons, vacuum level control dial and pressure gauges. Mounted on (4) leg base frame with casters. GEA Niro Model Multi-Processor MP-1 stainless steel, compact lab system for drying, coating, and spray granulation, fully self-contained with all controls and ancillary air handling devices built into the machines base and has capacity ranges of 0.2g to up to 6kg with total product per hour – depending on materials and application. MP-1 product container can also be used with the pilot-scale to MP-2 unit expanding its drying range from 1 to 25 kg in a through-the-wall application. Equipped with lab bowl for sizes: drying 0.2 to 3 Kg, top spray granulation 0.2 to 2 K g and coating 0.2 to 3 Kg. Peristalic pump with thru rates of 300ml per minute and self contained air handling unit with inlet and exhaust Hepa filtration. Control panel has PLC controller with Metro1010 touch pad controls with digital display and e-stop. Mounted on stainless steel cabinet. Virtis, Model USM15, lab size freeze dryer. 2¾ ft³ with Internal air bladder stoppering. Stainless steel chamber equipped with (2) anodized aluminum shelves 11¾" wide x 17" long . Shelf and condensor temperatures are continuously monitored with a shelf range of -60° C to 100° C and a condensor range of -80° C to 30° C. Enclosed stainless steel cabinet Measuring 20" Dia x 19" Deep and has a ice capacity of 15 lbs or 8 litres. United McGill Model 6D8, batch, vacuum shelf dryer, has 92.6 square feet of shelf area with number of product per hour – depending on materials, application and machine configuration. 304 stainless steel contact parts and carbon steel external parts with chamber dimensions of: 40-1/2" in Width; 49" in Depth; 35" in Height and has (9) stainless steel internally heated 39-1/4" wide x 42-1/2" long product shelves with 2-1/2" gaps and swing open, bolt down access door with (2) 6" OD sight ports. Liquid ring vacuum pump, vacuum gauge and vacuum release valve with a water system that will maintain tray temperatures at any desired setpoint between the temperature of the cold water supply and 100 Deg C. Capable of absolute pressure down to 0.23 psi and 0.47" Hg this is equivalent of 29.45" Hg vacuum depending on barometric pressure. Control panel has vacuum and circulation pump start / stop push buttons and temperature and vacuum touch pad controls with digital display. Mounted on 96" long x 60" wide forkable steel platform.